Although the Chadron Prep high school was shuttered in 1961, memories of that fine school linger. Prepsters continue to assemble annually to celebrate their good fortune at having been a part of the school. 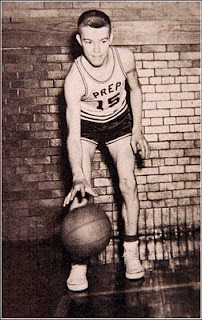 For many folks, the basketball dynasty honed by the legendary Archie Conn, is synonymous with Chadron Prep. There is a long list of names that ring true when thinking about outstanding basketball players at Prep. Muma. Amstrong. Lytle. Kuska. And within that list – if not at the top – is one James Hampton. A four-year letterman for the Junior Eagles, Jim Hampton was a bit on the short size for such a stellar player; he was an all-around athlete who performed nearly as well on the gridiron and the diamond as he did the basketball court. He was an integral part of the outstanding Chadron Elks baseball team for a few years back in the '50s. We can’t recount all of the statistics about this fine player, but we do know that he garnered 310 points in 24 during his senior year. Jim was a Class C All-State player on a team that dominated the Northwest Nebraska Conference – and most other competition. Of course, Chadron Prep also brought home several state championship trophies in those years. At a sprightly 73 years, Hampton still shoots hoops regularly in Michigan, where he and wife Shirley (Durham) have lived for many years. He has retired from a successful career with Dow Corning. We’re told that his free-throw percentage is considerably higher today than back in the 1950’s, and he was a superb shooter back in those days. If you have good photos of other Prep players from that era, we’d enjoy being able to share them here on Dawes County Journal. Drop us a line at galeymedia@gmail.com.